Look out into the winter deciduous landscape, and the first hints of color in early spring reveal the first flowers contrasting the dull, brown and gray trunks and branches. Not all early spring blooming trees are regarded as ornamental, such as red maples or birches, but still their flowers provide visual interest and some color. Large shrubs that have a tree-like form also provide excellent early spring flower color. Actually species of dogwoods, both the Cornelian cherry (Cornus mas) and the Japanese cornel dogwood (Cornus officinalis) bear tiny but numerous clusters of golden yellow flowers in early spring, about the time the first spring bulbs, like snowdrops, crocus and winter aconites, bloom. Between these two species, the Japanese cornel dogwood starts flowering about a week before the Cornelian cherry. Small trees with handsome V-shaped forms, witchhazels' flowers often scent the air with spicy fragrance. Some species truly begin blooming in midwinter, but in general, witchhazels will be among the first small trees bringing floral delight in spring. Yellow, red, orange and rust-colored, ribbon-like petals dangle from the branches. Three species are worth noting: Hamamelis japonica, Hamamelis mollis and the ornamental hybrid of the two, Hamamelis x intermedia. "Rosaceous" refers to any member of the rose family, and here includes all the early spring blooming species and varieties of plums, pears, apricots and peaches. 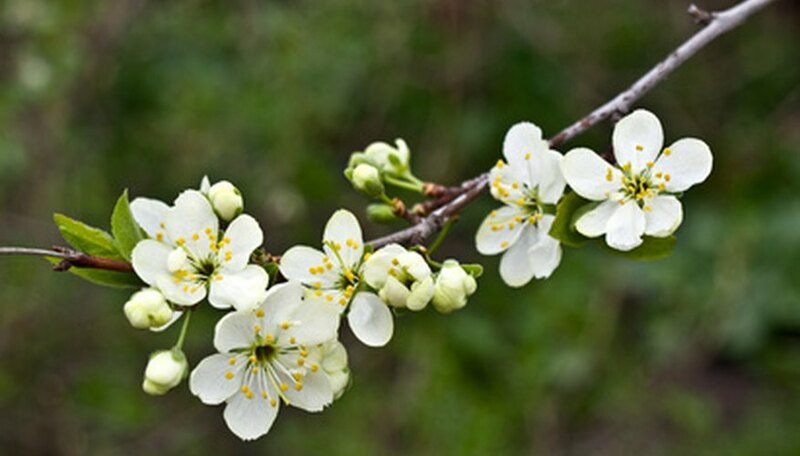 These four trees tend to bloom even earlier than cherries and apples. In fact, orchard growers often worry that the plums, pears, apricots and peach trees' flowers may be nipped by late frosts and compromise the later fruit crop yield. Common or European pear (Pyrus communis), American wild plum (Prunus Americana), Manchurian apricot (Prunus armeniaca var. mandshurica), Japanese apricot (Prunus mume) and any southern peach tree tends to flower while the rest of the trees in early spring remain fast asleep. Many tend to forget gardens in warm winter regions and subtropical zones, but there are trees in U.S. Department of Agriculture hardiness zones 9 and 10 that provide excellent early spring blooming displays. Trumpet trees are perhaps the tropical world's equivalent to cherry trees and cornels. Just before the vernal equinox, ipe (Tabebuia impetiginosa), golden trumpet trees (Tabebuia chrysotricha and Tabebuia umbellata) display their clustered tufts of trumpet-shaped blooms on branch tips.